With the third day of public viewing for the Queen of Soul has come a third outfit change. 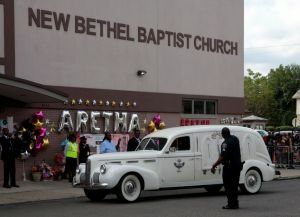 Mourners at New Bethel Baptist Church saw Aretha Franklin dressed in sparkling rose gold. Her floor-length gown was accented with gold-sequined Christian Louboutin heels. Her polished bronze casket sat at the front of the sanctuary, which was surrounded with photos of her and lavender and pink roses. The viewing is at a church where Franklin’s father was the longtime pastor and she learned the gospel fundamentals that would make her a soul institution. 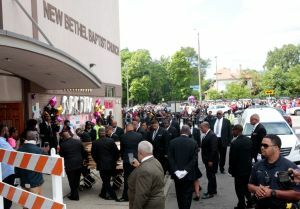 Hundreds of people lined Linwood Street for the opportunity to say a final farewell. The line to view Franklin, which stretched more than half a mile, was moving briskly shortly after noon. Thursday’s viewing comes after two days of viewings at the Charles H. Wright Museum of African American History. Franklin was dressed in red for the first day, and wore a baby blue dress on the second day. 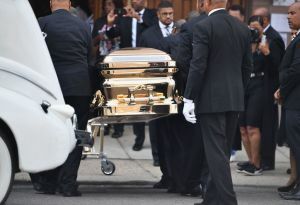 Aretha Franklin’s body has arrived for a viewing at the Detroit church where she got her start as a gospel singer. 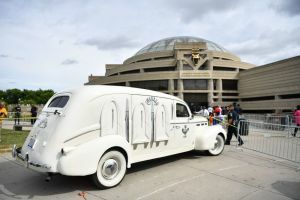 Crowds chanted Franklin’s nickname “Ree Ree!” and “Let the Queen through!” as Franklin’s body arrived in a 1940s hearse and was taken into the sanctuary. 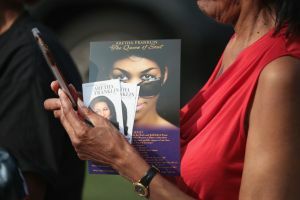 Hundreds of fans gathered outside the church for Thursday’s viewing at New Bethel Baptist Church, where Franklin’s father was the longtime pastor and she learned the gospel fundamentals that would make her a soul institution. The viewing follows two days of public viewings at the Charles H. Wright Museum of African American History that attracted thousands of fans and mourners from around the country. Franklin’s invitation-only funeral will be held Friday at the Greater Grace Temple, one of the largest and most famous churches in the city. Aretha Franklin, Queen of Soul, belonged to her God, her city, her community, and now, to the ages. The cultural institutions she loved have been on full display in the celebration of her life leading up to her homegoing services on Friday. 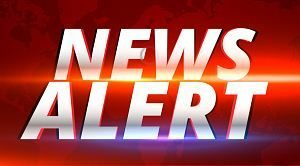 More than two dozen ministers, performers both secular and gospel, along with black entertainers, athletes and civil rights activists make up a who’s who list of black America that will pay tribute to Franklin in a marathon service scheduled to last at least five hours. 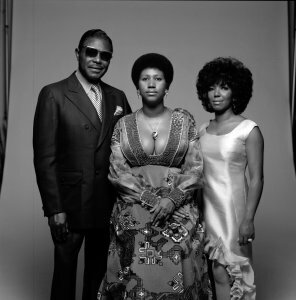 Aretha Franklin, center, with her father and sister Carolyn in 1971. Like Franklin, her ceremony will be undoubtedly and unapologetically black, said Detroit native and Georgetown University sociologist Michael Eric Dyson, who will speak at Franklin’s funeral. 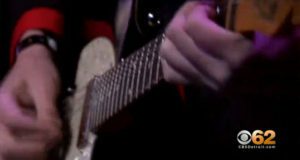 Franklin died Aug. 16 of pancreatic cancer at the age of 76. From the black museum that hosted Aretha Franklin’s public viewing for thousands of her fellow Detroiters, to the gospel tradition that launched her singular musical gifts, to her commitment to social justice through both song and financial assistance, so many here and around the country have expressed their gratitude to Franklin for staying in a city many had long since abandoned, for continuing to inspire a people so often deprived of dignity. She was a constant and common denominator of black life. In her final role, the funeral will cap a week of tributes that have been not only a testament to her life and musical legacy, but a triumph of black culture. The mix of pomp and circumstance with the everyday people Franklin knew and loved began Tuesday under the roof of The Charles H. Wright Museum of African American History, which long housed the world’s largest permanent exhibit of African-American culture. Franklin lay in repose at the museum for two days as thousands of Detroiters from all walks of life came to say goodbye. The black church and gospel, both of which loomed large throughout Franklin’s life, have been heavily represented in her farewells. 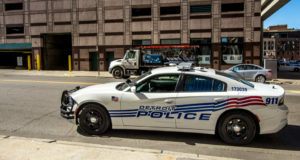 Her funeral will be held New Bethel Baptist Church, the Detroit headquarters of the civil rights movement, where her father preached from 1946 to 1979. “She would have had it no other way,” said Bobby Jones, a pillar of the gospel community who currently hosts the “Bobby Jones Radio Show” and was the longtime host of the popular “Bobby Jones Gospel” on Black Entertainment Television. Friday’s funeral services will have a jazz, mainstream and gospel section — appropriate because of her contribution to help popularize the genre, Jones said. “Gospel was written when black people were striving,” said Jones, who is leading the gospel section on Friday that includes genre powerhouses The Clark Sisters, Pastor Shirley Caesar and Tasha Cobbs-Leonard. Franklin’s faith is steeped in a proud tradition in the black community embodied by her father, considered one of America’s great preachers. Franklin, a dapper pastor, had his own personal tailor. Franklin will be eulogized by the Rev. Jasper Williams, who also eulogized her father. 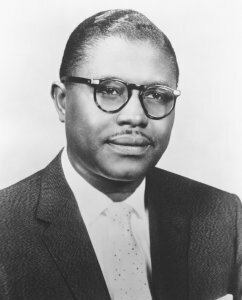 Williams is known for his “whooping” preaching style — similar to C.L. Franklin’s— that features a fiery delivery in the tradition of the black church and combines scripture with social issues. The church helped keep Franklin tethered to her Detroit community. She held annual revivals at New Bethel. Sapp said fans will see the impact of the black church on her life and career at Friday’s service. Sapp wouldn’t reveal what he will perform Friday, but said that every song is one picked out by Franklin. Actress Cicely Tyson, who will offer personal reflections about Franklin, was a pioneering actress during segregation who also lent her talents to racial progress. Others who will likely weigh in on her social justice work include former Attorney General Eric Holder and the Rev. Al Sharpton, the Rev. Jesse Jackson and the Rev. William Barber. But it is Franklin most of all, and what she has represented so long, for so many, that will be the balm to those left grieving her loss. Her message of respect rings true and is reborn in the current political and social climate for many, Dyson said.